After a few days immersed in education at the 2018 AGS Conclave, I’m eager to share some highlights from sessions I attended. One theme is the fact that as demographics and lifestyles are changing, opportunities for growth and new directions arise along with all of the well-known challenges. MILLENNIALS MEAN OPPORTUNITY. Retailers convinced that millennials don’t buy diamonds may not have all the information. In fact, millennials, who are now 24 to 38 years old, are much more likely to buy diamonds than any older generation, according to research from the Diamond Producers Association. Millennials spent $16 billion on diamonds last year, of which 50 percent was wedding and engagement jewelry. There are big numbers there, and big opportunity. By 2020, the generation’s disposable income will exceed $1.4 trillion. DPA focus groups reveal that millennials especially find value in the authenticity and rarity and individuality of diamonds. — From “Focus Group Confidential: Surprising Things We Learned From Millennials,” presented by Sarah Gorvitz, strategic communications and insights lead for the Diamond Producers Association. CATER TO SELF-PURCHASING WOMEN. Women’s roles, attitudes and empowerment are affecting all consumer purchases. When it comes to jewelry, women are celebrating myriad moments in their lives, which can be unrelated to family or relationship milestones. A 2017 diamond acquisition study revealed that bridal represented 24 percent of diamond purchase value in the U.S; gifting, 47 percent, and self purchasing, 29 percent, which reflects a 50 percent increase over the past decade. Women’s spending power has increased, and they are buying more diamond jewelry for themselves. – From “De Beers Group Insights to Influence Your Marketing and Selling Strategies,” by Charles Stanley, president of Forevermark U.S. CUSTOM IS KEY. Jewelry sales are growing ($91 billion in 2017) but jewelry sold by “other sellers” is rising much more rapidly than independent jewelry store sales. There are 91,000 places to buy jewelry but just over 23,000 jewelry stores. Today, 15 percent of engagement ring sales are custom; a decade ago, it was just 5 percent. So the ability to customize your offerings is key to increasing your sales. – From “State of the Jewelry Industry: Facts, Figures and the Future,” by Harold Dupuy, VP of strategic analytics at Stuller. RECOGNIZE CASUAL TRENDS. Dress has become more casual and jewelry needs to reflect that trend, too. Remember that business casual is now the norm for office workers, while those working at home are likely to be wearing yoga pants and T-shirts. Make sure you can offer casual, wearable jewelry styles that fit today’s culture. “Very heavy gem-set jewelry is the equivalent of Queen Anne dining sets or heirloom silver they have to polish. But it doesn’t mean they don’t want expensive jewelry. They just don’t want it to look like their parents’ jewelry. They value story, authenticity and individuality. You can’t count on younger customers growing into the taste for traditional fine jewelry.” – From “Too Old To Start Over But Too Young to Retire? Strategies to Balance Risk and Reward Amid Constant Change,” by Hedda Schupak, industry analyst and editor of the Centurion Newsletter. EDUCATE SHOPPERS ON DIAMOND SHAPES. The appeal of a diamond shape to an individual seems instinctive, says jewelry designer Jade Lustig. Lustig is founder and creative director of Jade Trau, and a fifth generation diamantaire. If you’re selling a diamond ring, figure out which shape your customer is naturally attracted to. “A girl who wants an emerald cut doesn’t even see the other shapes,” Lustig says. “Her eyes glaze over.” Diamond shape should be a basic of everyone’s education, she says. – From “The Majesty, Mystery and Miracle of Diamonds: Why Jewelry Designers Love Working With Them,” moderated by Deborah Marquardt, chief marketing officer of the Diamond Producers Association. MAKE EYE CONTACT. Studies show that 75 percent of the time the client is making eye contact with the seller – trying to assess their honesty — while the seller is looking at the client only 40 percent of the time. If you were to increase your eye contact 50 percent or more, your credibility automatically goes up. But don’t do it 100 percent of the time – that’s just weird. – From “Sales Influence: Find the Why in (How People) Buy,” by Victor Antonio. SLOW ‘EM DOWN. 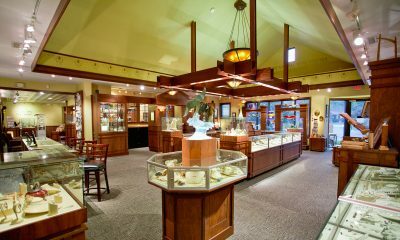 How can you get repair clients to look at jewelry while they’re popping in and out of your store to pick up or drop off repairs? In some strip center stores, it’s tough; a customer can literally walk down the middle and zing — right to the service desk. Consider adding an island, to create more of a flow around the cases. “You can’t make people look at things, but you can slow them down on their rush to pick up whatever the are there for. There may be a way to reuse your existing cases to create more of a meandering path, or maybe buying one new case would make it work.” – Interior designer Ruth Mellergaard of Grid 3 International, from “How a Store Renovation Improves the Customer Experience,” moderated by Trace Shelton, editor in chief of INSTORE. PROTECT YOUR WORK. Any original work of artistic expression qualifies for copyright protection. If a jewelry designer creates earrings in the shape of a bumblebee, for example, the designer can’t stop someone else from creating their own interpretation of bumblebee earrings. But a copyright can protect the specific design. The copyright is automatically secured when the work is created and fixed in a tangible medium. Notice of copyright is not required in the U.S., but filing for registration with the copyright office will help you prove you had the design at a certain date. To apply electronically, registration costs $35. JVC has published a guide titled “I Have An Idea! JVC’s Guide to Intellectual Property Law.” – From “Intellectual Property Laws for Jewelers,” by Sarah Yood, senior counsel for the Jewelers Vigilance Committee.